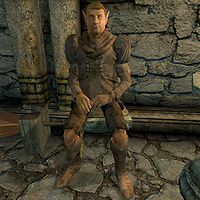 Brithaur is a Bosmer living in Crucible, New Sheoth. He continues to annoy the other residents of Crucible with his thievery. For this reason, Earil requests that you get rid of him. If you talk to Brithaur, he tells you that he will end his crime spree only when you bring him five Flawless Pearls to complete his collection. During the non-journal quest, The Paranoid Roof Watcher, it is revealed that Brithaur's current residence is stolen from another citizen of Crucible. He wears a pair of patchwork pants, a patchwork shirt and a pair of scruffy shoes. He also carries his key and a small amount of gold. Looting his corpse will reveal his heart which is used in his quest. Brithaur explores the city every day, looking for potential opportunities for theft. He sleeps from midnight to 8am upstairs in his house, and will have a two hour breakfast downstairs when he wakes up. After an hour of wandering around inside, he will exit the house at 11am for some reconnaissance. He will either go to Earil's Mysteries, Things Found or Cutter's Weapons, which he chooses randomly. If he was persuaded to stop thieving during his related quest he would instead wander around Crucible; alas, due to a bug this will never happen. If the Sacellum isn't being used for the Main Quest, he will break off his session of stealing at 2pm for two hours of worship there. This cuts short his previous activity, and he will confusedly hurry home for two hours of wandering. Otherwise he will continue to wander around his chosen location until it is interrupted again by his three hour supper at 6pm. After a busy day, he will relax at home until bed time. Newcomers are entering the Shivering Isles. With new people comes new treasure! They're saying that the Gatekeeper has been killed. Was it you? Did you do it? Did you get anything good from him? The Resonator is fixed again. What a shame. I looked forward to meeting new people. They always have such nice things. I once met Herdir after a misunderstanding about some candlesticks in Syl's great hall. He's not a bad fellow, actually. The Torch is relit. Wonderful. Just makes it a bit tougher to sneak around. It's a shame Syl's gone. She didn't pay a lot of attention to what was going on. Thadon gone.... I wonder if his quarters are still guarded. Did you hear? The Fringe was attacked! How horrible! The Gatekeeper has been rebuilt. I wonder if I could get a little piece of the old one. The armies of Sheogorath march again! Sheogorath is gone? If he is gone, then who is watching us? Do you know the best part about the end of a war? Picking the bodies clean of their treasure. On occasion, Brithaur will steal one gold from you shortly after greeting you. His epitaph in the New Sheoth Graveyard reads: "In the end, his last breath was stolen from him." On the Southern end of Brithaur's house on the roof you will find a pile of quills, bones, a knife and a potion of feather. This page was last modified on 20 October 2015, at 06:28.